I really enjoy living in Muskoka. It's liberating to have a job that satisfies my urge to bake, leaving my spare time open for other favourite activities, like running, reading and practicing painting. I miss working on recipes and having my own kitchen space, but because I sometimes stress myself out over creating new recipes, I am finding a summer away relaxing. For now, I leave my recipe workbook in a drawer, and, instead, spend my time refining my practical baking skills. The only thing I miss about baking for myself is eating it. 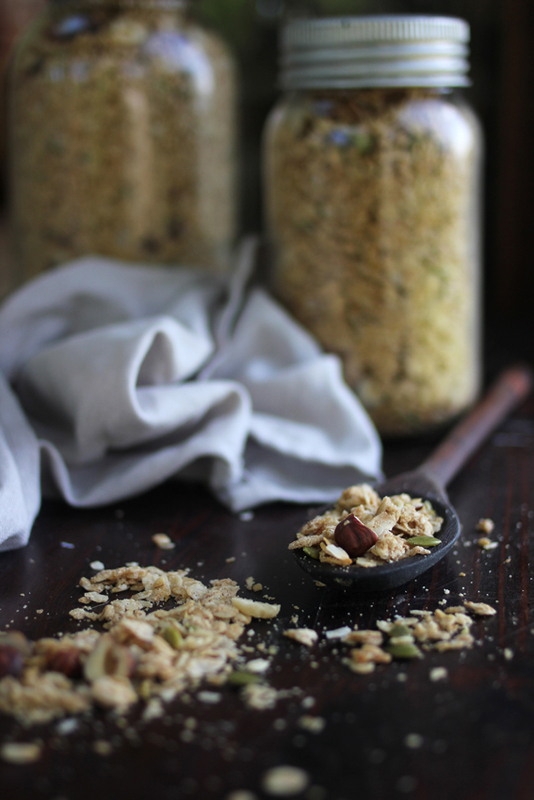 I had been making this granola during my last few weeks in Toronto, but with the activities of the pending move, never found time to share. This week, I paid a visit to my parents' cottage and took advantage of their new oven to refill my stock. I made the recipe below 6 times, hoping it'll last me until I next find myself with a kitchen. 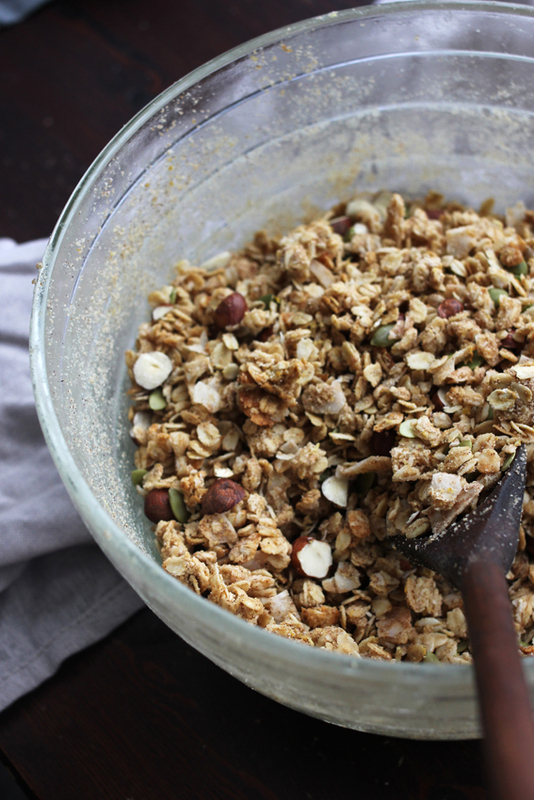 There is nothing complicated about this granola recipe. Everything can be mixed in one bowl, and the only reason I add the hazelnuts and pumpkin seeds after baking is because I don't like their toasted flavour. My favourite way to eat it is with yogurt and berries—original, I know. 1. In a medium sized bowl, combine oats, coconut flour, flaked coconut, lemon zest, cinnamon and salt. 2. Add coconut oil and maple syrup. Mix until combined—small clumps of coconut oil are fine, though this is not a clumpy granola. 3. Bake at 320F for 18-20 minutes, until oats and coconut flakes begin to golden. Stir as necessary for even baking. 4. 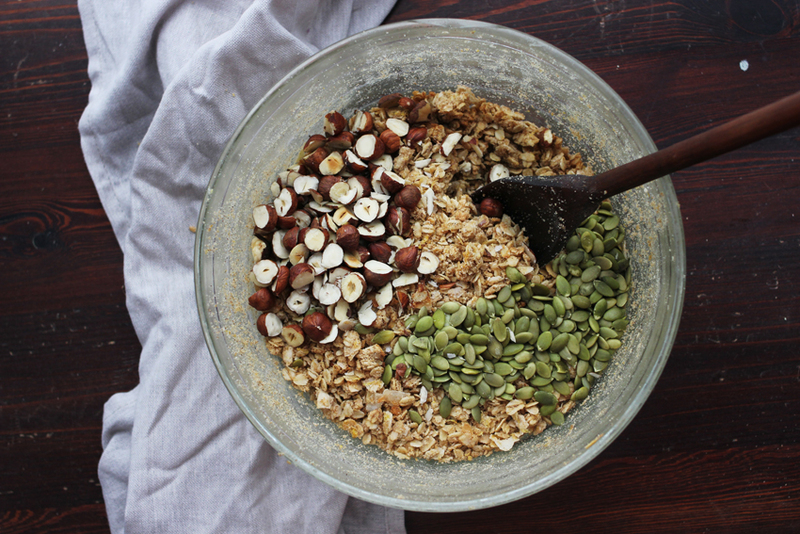 Once granola is baked, add hazelnuts and pumpkin seeds. This looks like such a good recipe - I like the addition of pumpkin seeds! I think I'll attempt this, as I'm always having to re-purchase granola and this looks better anyways. I also love pumpkin seeds. Nice pictures! Hope you had fun at the cottage! I love making my own granola. Great recipe. For a faster approach I cook mine on the stove top. I use what I have on hand, usually oats, ground almonds, honey and butter.